3-Way power - 12VDC, 120VAC, 20V MAX battery options. I used it today with my B&D 2.0AH leaf blower battery to adjust my rear air springs and all 6 tires prior to installing a new TPMS . It adds one psi to the programmed setpoint, and the digital gauge agrees with the “gold standard” Accutire MS-4021B. Comes with adapters for water toys and air mattresses too. I used it today with my B&D 20AH leaf blower battery to adjust my rear air springs and all 6 tires prior to installing a new TPMS . It adds one psi to the programmed setpoint, and the digital gauge agrees with the “gold standard” Accutire MS-4021B. Comes with adapters for water toys and air mattresses too. Does it take "forever" to bring a tire up to desired level? I have a CO2 tank that I used on my DP tires. It worked great to bring pressure to 100 lbs, but it is getting more and more difficult to find a source to fill it. Since I no longer have a full basement, it will take up a lot of room in my Toad. although I have not used it on 12V. I was only adding 5psi but it finished one tire while I checked the pressure on the next. Thanks. I think I will get one. My Lowes location is showing two in stock. You will need to buy a Li-ion battery too, but even the 2.0 AH max is still much cheaper than a comparable Dewalt, Ryobi, etc. You will need to buy a Li-ion battery too, but even the 20AH max is still much cheaper than a comparable Dewalt, Ryobi, etc. I was under the impression that it can be used without a battery by using a regular electric plug? Is that not correct? Runs on 110v AC too, battery not required. 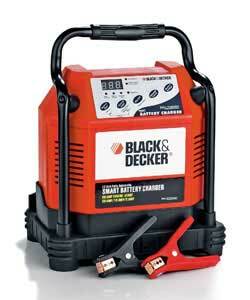 I see my Black and Decker 4-10-20-40 amp charger with start feature is no longer sold. It was re-styled a few years after I bought it. I can't find anything like it, not even under other brand names as was the case. This is the one I have and really like a lot. The cooling fan inside failed once so I installed a high quality industrial version. That and cans of fix-a-flat. A jumpstarter is a much easier way to be the hero when someone's (or your own) engine won't turn over. The ones I see for sale today, the amperage have a 15 amp max output, not 40 amps like my older one. 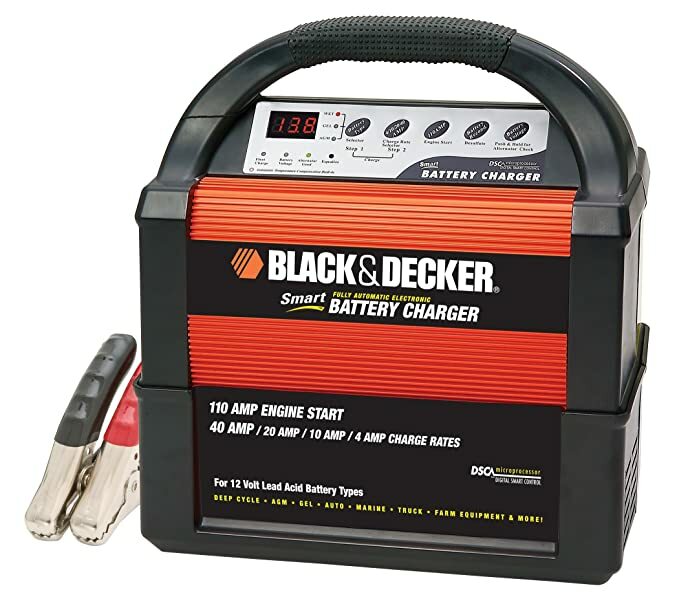 The 15 amp version is fine for regular vehicles with a single battery, but the 40 amp version is idea for a motor home with a pair of house batteries begging for a quick recovery via the Onan generator. My on-board Tripp-Lite converter/inverter has a 20 amp max output, more than the new portable one. At that point, my main reason to have one has ceased to exist.